The main idea of the Parallelism is splitting the main task into smaller tasks, running simultaneously, with each task accomplishes part of the job, then assigning these tasks to a number of processors and finally combining the partial results into one final result. You can imagine the parallelism as running multiple serial plan tasks at the same time in a parallel plan, each task runs on a separate processing unit using its own server connection. In this way, a parallel will run much faster than the serial plan. There are few technical terms that we should understand in order to be familiar with the parallelism. The first term is the Scheduler, which is the physical or logical processor that is responsible for scheduling execution of the SQL Server threads, taking into consideration that only one thread can be in the running state at any given time. The second term is the Worker, which represents the thread that is bounded to a specific schedule to accomplish a certain job. The fourth term is the Task, which represents a piece of work scheduled by SQL Server and assigned to a specific SQL Server worker. The Execution Context is where each task run inside, with each task runs inside only one execution context. The Parallel Page Supplier is a SQL Server Storage Engine component that is responsible for distributing the rows to be processed within the involved workers upon the workers’ demands and requests. The last component is the Exchange, that is responsible for connecting the different execution contexts of the parallel plan together. Before executing a query, the SQL Server Database Engine checks if the parallel execution is required depending on many factors, such as, if the SQL Server instance is running on a server with more than one CPU, if the required number of threads is available and can be satisfied, the workload type, if the number of rows to be processed is sufficient to use parallel plan and if the query cost exceeds the Cost Threshold for Parallelism value. If it is required, the SQL Server Database Engine detects the number of threads and distribute the execution of the tasks among these threads. The number of workers that the SQL Server Database Engine assigns for each parallel plan execution to perform a specific task is called the Degree of Parallelism (DOP). Which also determines the number of processors that will be used to execute a parallel plan. The number of processors that are used in the parallel plan execution can be limited using the Max Degree of parallelism option. Setting the Max Degree of Parallelism option to 0 will allow the SQL Server Engine to use all available CPUs on the current server up to 64 processors in the parallel plan execution. Only a Max Degree of Parallelism with a value equal to 1, serial plan execution will be used. You can override the Max Degree of Parallelism default value to specify the number of processors to be used in the parallel plan execution by setting it to any value between 2 and 32,767. If the value of the Max Degree of Parallelism is greater than the actual number of processors in the server, the actual number of processors that will be used in the parallel plan execution is all the available processors. If the SQL Server instance is hosted on a single processor server, the Max Degree of Parallelism value will be ignored. Parallelism is a fantastic SQL Server option that is used to take benefits of having more than one processor on the hosting server and split the current task into smaller tasks and distribute it among the available processors in order to complete it faster. 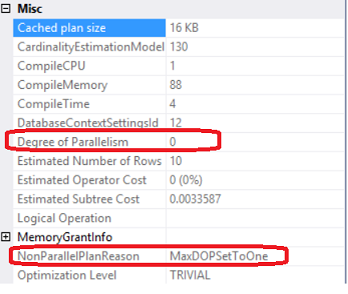 Max Degree of Parallelism can be used to set the maximum number of processors that can be used to run the query in the parallel plan execution. There are many ways that can be used to set that value at the server, database, and query level.